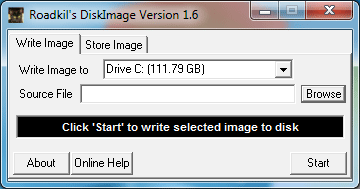 RoadKil’s Disk Image is a Free Backup Image Software Tool created by Jason Hatley. This tool might be used to create a backup disk image “.img” file or a cloned copy of a USB, Floppy, hard drive, or partition. Disk Image can also be used to write third party and self created images back to floppy, USB, or hard disks, or effectively create a clone of a disk by using the same image on more than on disk.